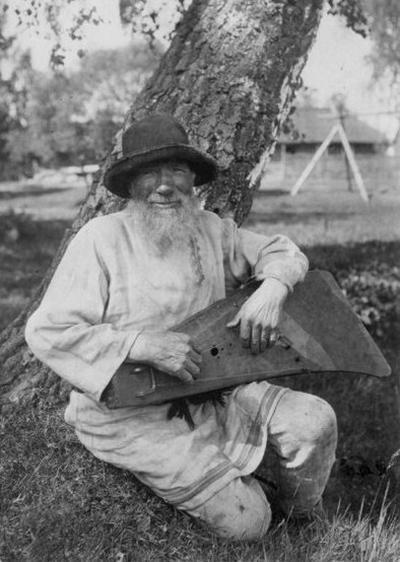 Ah, a singer from Eastern Karelia in Finland playing a nice air to Vainemooinen on his kantele. The kantele is larger than the older traditional five stringed one described in the Kalevala but still so much smaller than the modern 36-38 stirnged instruments. If you want to find out more about this just check out kantleles on the net. If you find yourself in Helsinki sometime, you can visit the Lonnrot Institute and check out almost two centuries of research into the traditional airs and music of Finland. Interesting. I was thinking it was a kokle.